It was just a few weeks ago that 50,000 bees were found dead in an Oregon parking lot, and now the ongoing problem has hit north of the border in Ontario, Canada where more than 37 million bees have been found dead. In the past, many scientists have struggled to find the exact cause of the massive die-offs, a phenomenon they refer to as "colony collapse disorder" (CCD). In the United States, for seven consecutive years, honeybees are in terminal decline.The problem has brought beekeepers to crisis in an industry responsible for producing apples, broccoli, watermelon, onions, cherries and a hundred other fruits and vegetables. Commercial honeybee operations pollinate crops that make up one out of every three bites of food on our tables. According to the annual survey by the Apiary Inspectors of America and the US government's Agricultural Research Service (ARS), The number of managed honeybee colonies has fallen by over 30%.US scientists have found 121 different pesticides in samples of bees, wax and pollen, lending credence to the notion that pesticides are a key problem. "We believe that some subtle interactions between nutrition, pesticide exposure and other stressors are converging to kill colonies," said Jeffery Pettis, of the ARS's bee research laboratory.The collapse in the global honeybee population is a major threat to crops. It is estimated that a third of everything we eat depends upon honeybee pollination, which means that bees contribute over 30 billion to the global economy. Dave Schuit, who runs a honey operation in Elmwood, Ontario says he's lost more than 600 hives -- that's more than 37 million bees -- in 2012 alone. 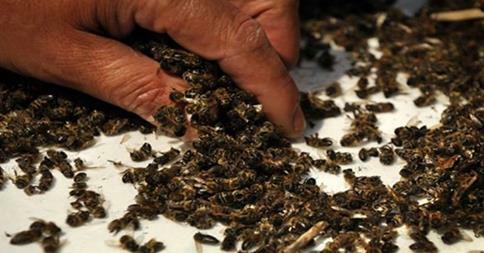 Schuit says he's been seeing his bees die at a rapid rate every spring in the last few years. "This is how they die,” Schuit explained to The Toronto Star, pointing with a broad hand to a bee that’s gone haywire, flailing erratically in the grass. “Their tongue sticks out and the venom drips out their backside.” According to the 48-year-old apiarist, neonicotinoid pesticides are to blame for the loss. The Collective Evolution finds that the deaths occur after the pesticide dust is blown into the air (used to coat corn seed with air seeders). A study from the Proceedings of the National Academy of Sciences (PNAS) shows that the causes of CCD may be more varied than scientists expect. The bees may be dying not from a single toxin or disease but rather from an assault directed by a collection of pathogens. A research team led by entomologist May Berenbaum at the University of Illinois compared the whole genome of honeybees that came from hives that had suffered from CCD with hives that were healthy. The sick bees exhibited genetic damage that could account for the die-off, and that damage indicated that they might be afflicted with multiple viruses simultaneously. This could weaken them enough to trigger CCD. "It's like a perfect storm," says Berenbaum. Health Canada's Pest Management Regulatory Industry began taking samples from dead bees in Ontario and Quebec. Schuit's bee's were a part of that study and now the agency is now "re-evaluating" the pesticides status while analyzing more samples this year. Two of Bayer's best-selling pesticides, Imidacloprid and Clothianidin, are known to get into pollen and nectar, and can damage beneficial insects such as bees. The marketing of these drugs also coincided with the occurrence of large-scale bee deaths in many European countries and the United States. The non-profit group NRDC filed a lawsuit in August 2008 to force the U.S. government to release the studies it ordered on the effect of clothianidin on honeybees. NRDC attorneys believed the EPA already had evidence of a link between pesticides and the mass honeybee die-offs, yet was not making the information public. NRDC is now being allowed to look through the studies. "Clothianidin has the potential for toxic chronic exposure to honey bees, as well as other nontarget pollinators, through the translocation of clothianidin residues in nectar and pollen...In honey bees, the effects of this toxic chronic exposure may include lethal and/or sub-lethal effects in the larvae and reproductive effects on the queen." 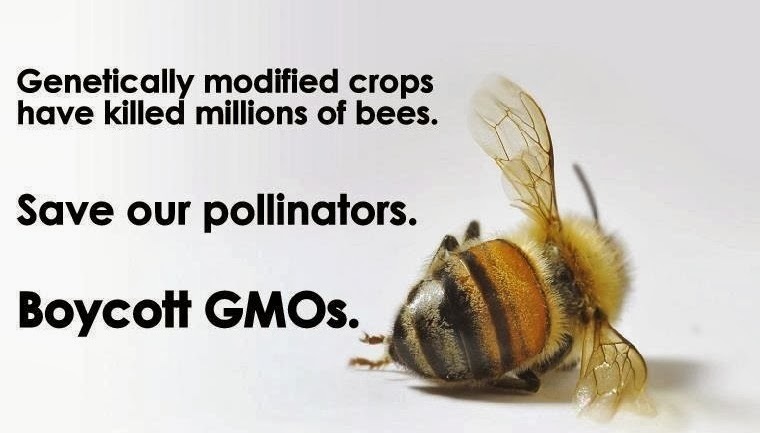 Unfortunately, the EPA approved neonicotinoid pesticides on the basis that the amounts found in pollen and nectar are not enough to kill bees. This says nothing of their potential to impact the bees on a non-lethal level, and, in fact, studies have shown that the substances can impair bees' learning and memory even at low doses. France, meanwhile, after reporting large losses of bees after exposure to Imidacloprid, banned it for use on corn and sunflowers, despite protests by Bayer. In another smart move, France also rejected Bayer's application for Clothianidin, and other countries, such as Italy, have banned certain neonicotinoids as well.